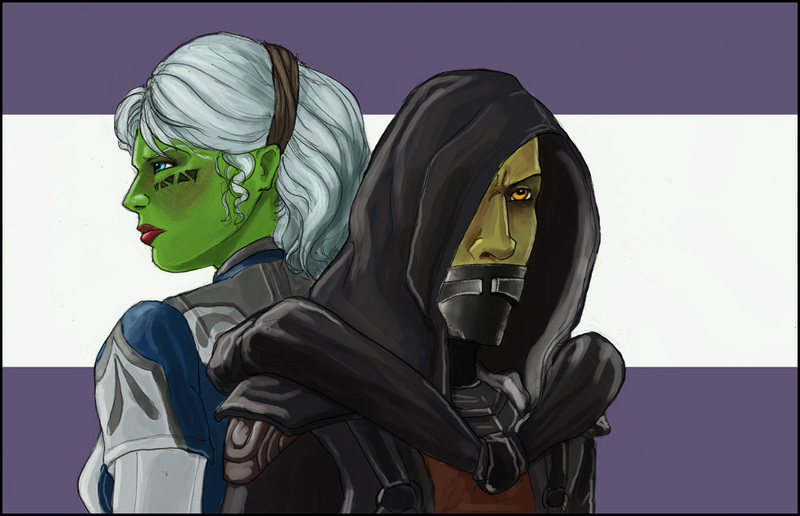 Soooo, species of the month has ended up being a decent enough excuse to do up a portrait of the first characters I played with my husband on SWTOR, haha. Mirialan Jedi, though Sparrow really should have been kicked out of the Order a long, long, loooooong time ago. Anyway, here they are, in case their likeness can be of use to any GM out there! ...probably something to do with the fact that he's a vain, self-serving, merciless piece of work with an ego the size of your average space station! -- who told you I've got a thing for the super-confident-super-competent ones...!!! Ahh, if only he came with a suave British accent. Maybe Mirilans have Irish accents, they are green. Or they could be leprichons. Excellent pic. The guy looks like a cross of Revan and Malak (so cool to combine those two). The woman is well done and the shading/coloring is great. Awesome!! Tussy, this is amazing!